Bewley's Hotels Blog: Longitude @ Marlay Park - a weekend not to be missed! 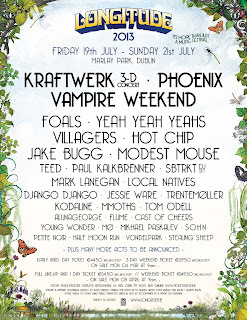 Longitude @ Marlay Park - a weekend not to be missed! Longitude Music Festival has been confirmed to take place in Marlay Park in Dublin from Friday 19th of July until Sunday the 21st of July. The tickets for the festival will be on sale from Monday the 4th of March through Ticketmaster. You can buy a full weekend ticket or if you would like to go for one day, you can buy a day pass ticket. Tickets are priced from €44.50 including booking fee. The Music Festival has no camping facilities so Bewley's Hotel Leopardstown is the perfect base for fans attending the concert - the hotels ideal location, just 10 minutes away from the venue and just located off the M50 - takes the hassle out of those "where to park" dilemmas! !